With the bluetooth radio module NIBObee Blue you can remote control your robot by an Android App. Additionally the modul transmits sensor values. These values can be displayed e.g. on Android smartphones. The BKit-XS add-on contains two phototransistors, two infrared LEDs and some other parts to build a contact-free obstacle detection for the NIBObee. 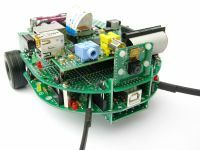 The connection kit NIBObee Berry contains one NIBObee Berry circuit board, mounting parts, battery holders, one camera holder and all necessary parts to control a Raspberry Pi module on the NIBObee. 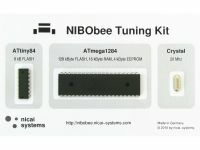 The Tuning-Kit contains one ATmega1284 with 128 kByte flash, one ATtiny84 with 8 kByte flash and one 20 MHz crystal. Both controllers are already programmed and so they are ready to use. With the Graphic-Display add-on BGX1 the NIBObee gets a graphic display with background lighting, four LEDs and four buttons for interaction with the user. 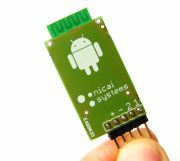 The display is controlled by an own microcontroller (ATmega88). The Experimental Circuit Board BXT9 provides more than 700 soldering pads and much space for own projects and ideas. The kit contains the circuit board, pin headers and mechanic mounting parts. The component-kit BKit1-LEDs contains 16 yellow 3mm-LEDs, enameled copper wire and all needed parts to build a lighting effect for the NIBObee in combinbation with a BXT9-board. 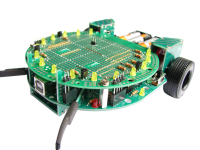 The component-kit BKit2-Distance contains 8 phototransistors, 8 infrared LEDs, enameled copper wire and all needed parts to build an obstacle detection for the NIBObee in combinbation with a BXT9-board. The component-kit BKit3-Remote contains one SFH-5110 receiver and all needed parts to build a transmission and receive system for infrared signal of RC5-compatible remote controls for the NIBObee in combinbation with a BXT9-board.